The fourth edition of the global culinary event, ‘Goût de France’, an initiative of the French Ministry of Europe and Foreign Affairs in collaboration with French Embassies worldwide and Atout France, will amass a staggering 3,300 restaurants in 150 countries and five continents that will all serve French-styled menus to its patrons on March 21, 2018. Each participating restaurant will donate 5 per cent of the proceeds of this evening towards a local NGO. This year, 63 restaurants across India will be celebrating the flavours of French cuisine. 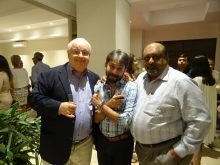 As a prelude to the event, networking soirees for the travel trade fraternity and media are hosted by Consular services in different Indian cities and on the day of the event, a reception is hosted in New Delhi at the Residence of France under the patronage of His Excellency, Ambassador of France to India. Goût de France will also pay homage to legendary chef Paul Bocuse who was symbolic to French cuisine for half a century. Participating chefs will be invited to present a dish from his repertoire or an inspired creation. The event will honour the Nouvelle-Aquitaine region renowned for its exquisite French wine, with the global brand of Bordeaux, rich in various gastronomy and wine experiences.